In antiquity, Petra was the capitol of Nabataea (ca. 168 B.C. - A.D. 106), a prosperous kingdom established by Arab nomads who migrated out of the Arabian Peninsula in the 4th century B.C. 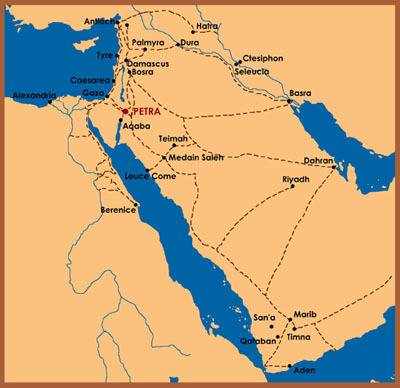 Petra was located at the crossroads of the major caravan routes that cut through the region; it was the hub of a vibrant trading network linking East and West.